Brussels sprouts. Do you like them? I thought I hated them pretty much my whole life until…until I had them roasted. I thought of Brussels sprouts as mushy little blobs that disintegrate in my mouth and taste like old socks. That’s because that’s all I’d ever had. Brussels sprouts out of the freezer section, steamed to death and then plopped on my plate. Yeah, I still hate that kind. But maple and mustard glazed roasted Brussels sprouts? I can get behind that. Oh, anything tastes better roasted, but especially Brussels Sprouts. With their little leaves that fall off and get all crunchy when they’re roasted. And their cute little bodies that look like miniature cabbages. I’m smitten. Pair that with some carrots, maple syrup and grainy mustard and you have heaven on a plate. Seriously. That sweet and salt combo cannot be beat. This makes a great side dish, or can be served as a main dish on a bed of of rice and chickpeas. Once you get through the chopping, the dish comes together very quickly. Throw is on a sheet pan and roast for about 25 minutes, which gives you ample time to prepare the rest of your meal to go with it. 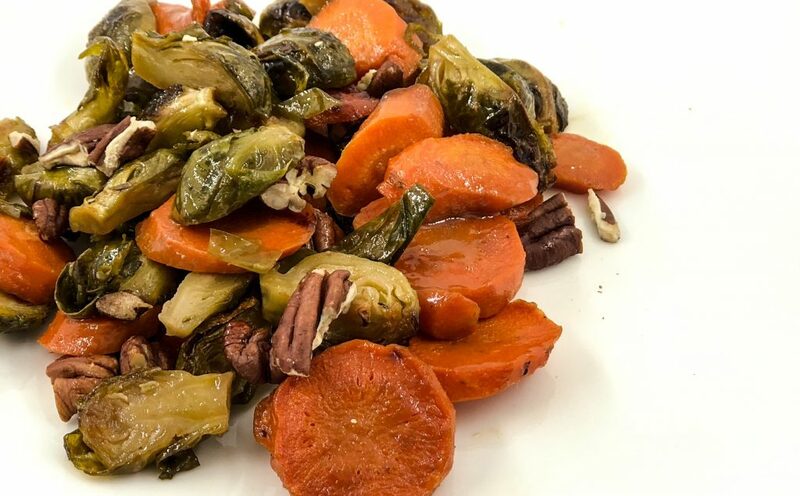 I had some Wild Rice Stuffing leftover from Thanksgiving and topped it with these Brussels sprouts and carrots. Winning combination. It turns out that Brussels sprouts are not only delicious, but extremely healthy for you too. Just a 1/2 cup of cooked sprouts offers 130% of your recommended daily allowance of vitamin K and 80% of your vitamin C. They are also high in antioxidants, fiber and have anti-inflammatory properties. 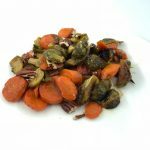 Besides how delicious they are (roasted, not boiled obviously), they are also a nutritional powerhouse. And the carrots you ask? They’re good for your eyes, of course. Rabbits have 20/20 vision and never have to wear glasses because of all the carrots they eat, right? Well, I don’t know about all that nonsense with the rabbits, but they are actually good for your eyes among many other things. They are high in lutein, which is good for eye health, as well as beta-carotene (which is converted into vitamin A in the body) and more of that good old vitamin K.
So, with all this talk about vitamin K, what’s so good about it? Vitamin K is a necessary vitamin for bone health and blood clotting. Studies have suggested that there is a correlation between low vitamin K intake and osteoporosis, and that vitamin K supports the upkeep of strong bones and improves bone density. Yay for vitamin K! Even if you are a staunch Brussels sprouts hater, perhaps these little nutrition tidbits will encourage you to give them a second (third? fiftieth?) chance. Not only are they packed with nutrition from head to toe, this particular recipe is especially tasty. The combination of the sweet, the salty, and the tangy mustard is enough to win just about anyone over. Enjoy! 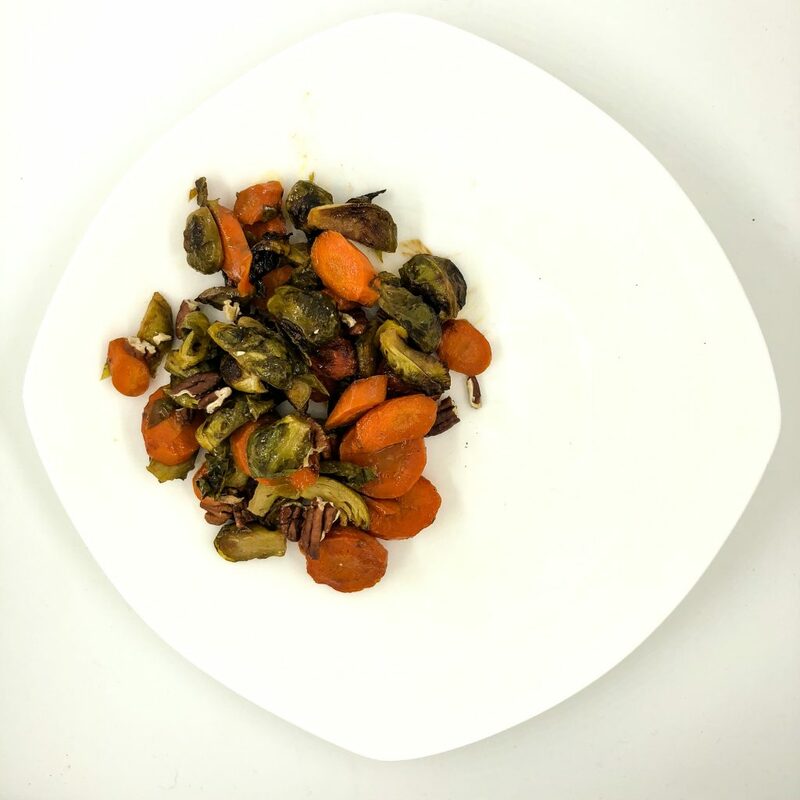 Brussels Sprouts and Carrots tossed in a glaze of grainy mustard and maple syrup. Preheat the oven to 425F. Line a sheet pan with parchment paper and set aside. In a large bowl whisk together the salt, olive oil, maple syrup and mustard until fully combined. Add the Brussels sprouts and carrots and toss to coat. Put the Brussels sprout mixture onto the prepared sheet pan and spread into an even layer. Bake for 15 minutes. Stir and bake another 10 minutes, or until the Brussels sprouts are tender when pierced with a fork and the syrup from the glaze is slightly caramelized. Remove from the oven and toss with toasted pecans. Enjoy immediately. Make ahead: Make the glaze and chop the Brussels sprouts and carrots a day ahead of time. Nut-free option: Use toasted sunflower or pumpkin seeds, or omit altogether. Made this recipe. It was absolutely delicious. And it’s doable for those of us with marginal cooking skills. You’ve got to try it even if you aren’t a big fan of brussels sprouts. Thanks Maggie for bringing it to our vegetarian table. Yay!!! Thank you so much for trying it out Ken, and commenting too! I’m happy you liked it and could make it with your limited cooking ability! 😉 ha. We LOVE this recipe. It tastes great and the recipe is quick and easy. It has become a regular staple in our dinner veggie rotation.